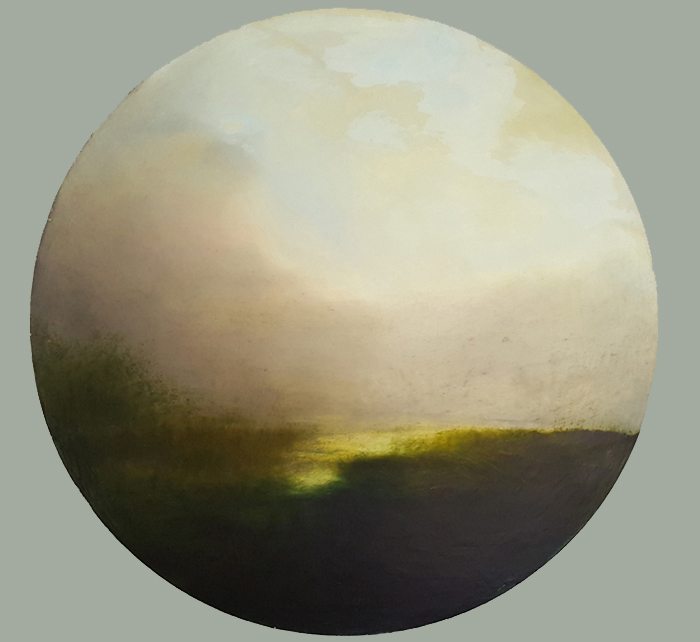 Lorraine Bewick has taken tried and tested techniques in the tradition of figurative landscape painting and applied them to her own perspective of the English landscape. Based in west Norfolk, her interest in interpreting Norfolk’s expansive skies and coastal reaches as liminal space treads a path mapped out by acknowledged masters of the genre, such as John Robert Cozens and JMW Turner. Having embarked upon her project of painting the tangible, Lorraine Bewick’s considerable skill is interpreting the indescribable aspects of a more measurable topology. Boundaries are moved, scale and distance shift in her hands, as she conjures up fine veils of light passing between horizon and foreground. Paint is made substance, while calibrating the troposphere and navigating thresholds between sky, land and sea. The viewer is included in the rules of the game that is going on here. Our perception is being played with. There is no square footage land is not a quantifiable commodity. Bewick draws upon the landscape and its features in her paintings describing an underlying emotional character. The forms glisten, brood and feel bruised, appearing barely arranged into a composition, while suddenly describing a gully cutting through the marshland or a ridgeway set against a stark sky.